Just a week or so until Thanksgiving. Here’s a free printable for you. 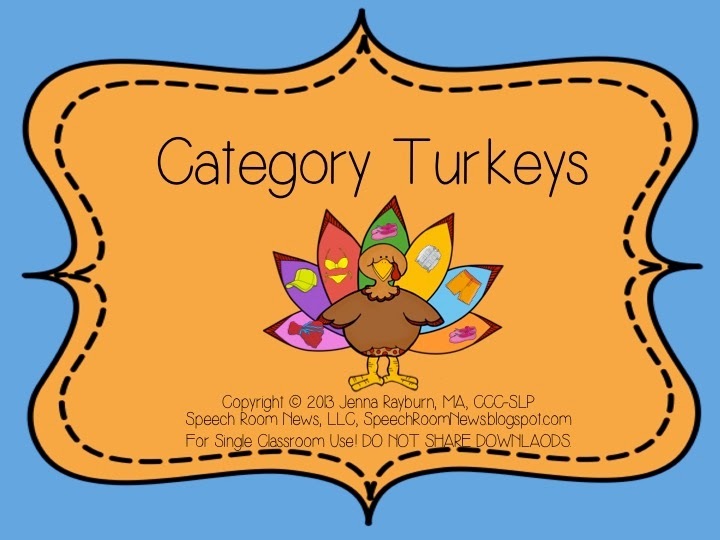 This receptive language activity is great because it works for non-readers! We’ve been playing with it in preschool – 2nd grade! I updated this file as of 11/7/13! Download HERE for Free! ! 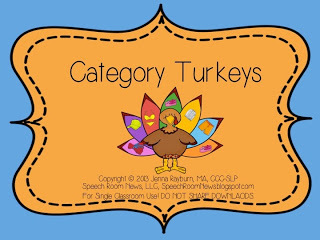 First your students can sort turkey feathers onto the correct category bird. Next, I have them use the word in a sentence too! Have fun! Gobble Gobble! Thanks for stopping by my blog! I really just started posting SLP posts but I find I like them even better than my personal posts! I love your site! I am going to try your Contact Paper Collage in December! Thank you, Jenna, this is great! I used today with some artic kids too- we sorted the feathers based on if the pictured word had the target sound or not. 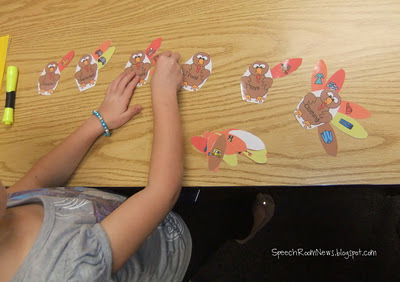 Then went back and made sentences with the feathers from the target sound turkey. Made this yesterday for my preschool students. They LOVED it! I love your blog. Such great ideas!!! Found you via Pinterest! Thank You! More preschool activities please!! I love all of your activities, but none of my kids are reading yet. This is wonderful – thanks!! This looks like fun, Jenna! Thanks for sharing! !